A 1985 Mercedes-Benz 500 SEL that Jackson owned and ultimately gave to an aunt as a birthday gift is up for auction. 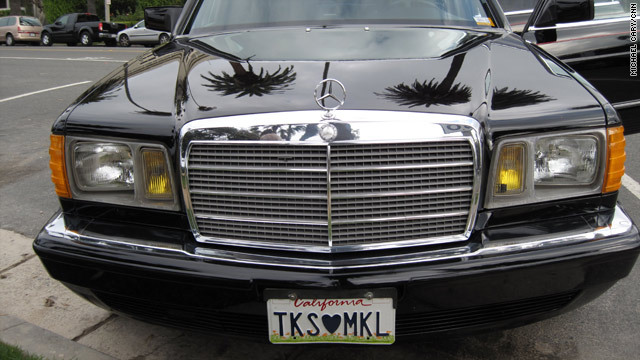 She changed the license plate to an abbreviated form of "Thanks Michael." Los Angeles, California (CNN) -- For more than 30 years, Betty Alonso has held on to a glittery concert scarf Michael Jackson sent her when she was 12 after the two met face-to-face after a concert in Caracas, Venezuela. But now Alonso, the mother of three, has decided to sell the scarf and the accompanying handwritten letter signed by the pop star to the highest bidder. "I'll hold the memory in my heart and in my mind," Alonso said, but she added now she could use the money to help pay for her children's private school, or a new roof. She's among more than 30 fans, associates and family members of Michael Jackson who contacted Julien's Auctions to sell their gifts and collectibles tied to the King of Pop. An auction is slated November 21 at the Hard Rock Cafe in New York's Times Square. Some of the highlights of the more than 80 items are directly tied to the singer's legendary career: the white glove Jackson wore when unveiling his moonwalk to the world, his handwritten lyrics to "Beat It," zombie costumes and the mold used to make his fangs for the video "Thriller," and a fedora he wore during his lengthy performance at the MTV Video Music Awards in 1995. The auction is being handled by Julien's, the same company that had planned to sell about 2,000 items from Jackson's Neverland Ranch in April. That auction was canceled by Jackson the same week his belongings went on public display. "We had been promoting this sale for four or five months all over the world. We had hundreds of thousands of people registering to bid for the sale," said Darren Julien, president and CEO of Julien's Auctions. "All these people were hungry for something or a piece of Michael Jackson, so what it did was whet the appetite." That's why, according to Julien, his company was tops on the list when people wanted to sell their belongings that had ties to Jackson after he died in June. "Michael was very generous," Julien said. "If you were friends with Michael Jackson or an important part of his life, occasionally he would give something away, and that's a very big reason that these things got out in the public." That's apparently what happened with the white, jeweled glove Jackson wore when he amazed crowds by performing the moonwalk during the Motown 25th anniversary television special in 1983. Backstage, after the performance, Walter Orange of the Commodores said he asked for Jackson's autograph. Jackson gave him the glove instead. The two had a long history -- the Commodores opened for the Jackson 5 in the early '70s. "The legacy that (Jackson) left behind is bigger than life for me," said Orange. "I hope that through that glove people can see what he was trying to say in his music and what he said in his music -- we need to come together as one." The glove is estimated between $40,000 to $60,000, but Julien said he expects bids to reach "the six-figure range," Orange said. He plans to give a portion of the proceeds to charity. "I had that. I owned it, and now the world should see it," Orange said. The auction also allows the world to see photographs of Jackson engaged in simple activities with ordinary items, thus increasing their value. That's the case of a 1985 Mercedes-Benz 500 SEL that Jackson owned and ultimately gave to an aunt as a birthday gift. She changed the license plate to an abbreviated form of "Thanks Michael." "What's even more significant is that we have photos of Michael driving the car," Julien said. "When have you seen Michael driving a car? He was always chauffeured or driven." Julien said the car is in great condition with bells and whistles Jackson wanted, including tinted windows and an elaborate sound system. He's right there with the ranks of Elvis Presley and Marilyn Monroe. An acoustic guitar that Jackson was photographed playing during his breaks on the set of the 1978 film "The Wiz" belonged to a movie make-up artist and is estimated at $6,000 to $8,000. "These were the very few times Michael ever played guitar," Julien said. "He was a singer, a performer on stage, but not with a guitar." Among the oddest item is a chocolate bar stamped "Lisa Marie and Michael" to commemorate Jackson's marriage to Lisa Marie Presley. The bar is estimated at a couple hundred dollars. Julien said he accepted that item because it reminded him of a piece of wedding cake from the marriage of Britain's Prince Charles and Diana that he auctioned for $7,000 years ago. Julien said there's another significant item tied to a fedora Jackson wore at the 1995 MTV Music Video Awards. The hat was auctioned at a charity event that same year and the letter of verification is signed "Lisa Marie Presley Jackson." "To my knowledge, there were not a lot of letters that she signed with her full name," Julien said. There are a number of autographed photos, as well as signed books, collectibles and artwork. There are even a few two-fers for autograph seekers: a painting of Jackson with Elizabeth Taylor, signed by the celebrated friends, and a backstage pass to a Democratic National Convention fundraiser at the Apollo Theater in New York, autographed by Jackson and former President Bill Clinton. Even Jackson's doodles and sketches of the likes of Frankenstein, Mickey Mouse and Charlie Chaplin are up for sale. Julien said basically, anything the King of Pop touched is valued by fans and investors alike. "He really was a living legend when he was alive, but now he's right there with the ranks of Elvis Presley and Marilyn Monroe," Julien said. "I think that Michael looking down on us right now would get a kick out of the fact that there are so many fans that just want a piece of him."